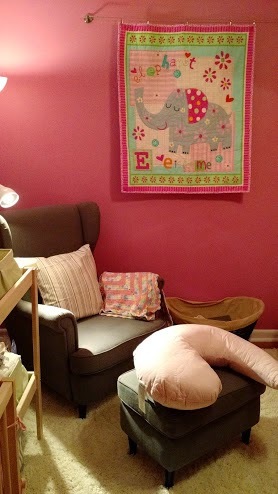 I have made Meredith a baby quilt once before. But I like making more and since she is having her third child I figured why not! At the last shower I found out that she was partial to yellow. I found this yellow panel in my stash. I was so very lucky to see the perfect blue in my stash!!! I wasnt able to be at her baby shower but met her a week later in hosting another friends shower so I was able to give it to her then! There is a slew of baby showers so you all can see some of what I have been working on. +Brendyl Smith and +Bryan Smith had their baby shower last Saturday. They have 2 little boys and now is having a girl! So she got a lot of pink things. I didnt know she was naming the baby Eleanor (Ellie for short) when I picked out this fabric. Then I couldnt decide how to quilt it so +Dave DeBaeremaeker suggested I quilt around the elephant. And then I echo quilted inside of the elephant and did some straight line box things for the rest. Here is a link to all the baby shower photos I took that day.